Quintanilla had started the day in overall second place and was a candidate for a podium place in Buenos Aires on Saturday. His goal was to improve on his third place finish in 2016. The rally resumed Thursday after another cancelled stage on Wednesday. Torrential rain in the region at the beginning of the week brought down an avalanche across the liaison road on Tuesday afternoon halting the progress of some of the competitors and many of the service and logistics vehicles. The road was not cleared until Wednesday afternoon and the vehicles were racing to catch up with the rally at Thursday’s overnight stop in San Juan. 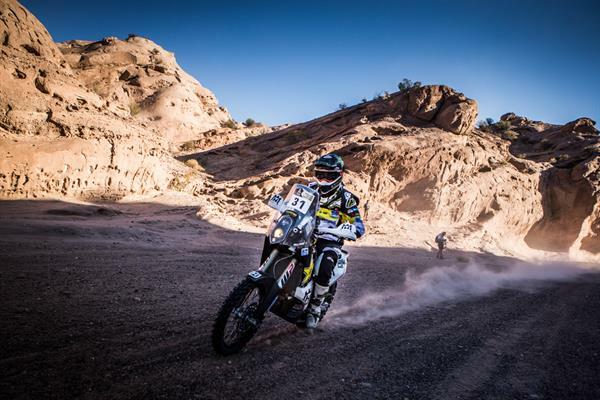 Stage 10 was from Chilecito to San Juan, a distance of 751 km, including 449 km of timed special. It continued to challenge riders with difficult navigation but with the first section, being akin to trials riding, offered terrain that lent itself to Renet’s riding skills. He came to the rally team in 2016 as a proven Enduro World Champion. Renet’s goal is to see the finish line in Buenos Aires on Saturday and that is now within his grasp, as is a possible top five finish. Spanish rider Joan Barreda is in front of him in the overall standings, but only by several minutes and the Dakar Rally is never over until it is over. Friday, the penultimate stage of the 9,000 km epic through Paraguay, Bolivia and Argentina, takes riders from San Juan to Rio Cuarto over 754 km, of which 288 km is under the clock. The first part of the timed special takes in the dunes of San Juan.